Tuesday’s municipal elections in Israel attracted an overall national turnout of 55%, some 10% higher than the local races five years ago, according to Interior Ministry figures released as the polls closed at 10pm. Turnout was higher than usual in cities across the country, because, for the first time ever, the municipal elections were declared a work holiday. The voting turnout rates in 2013 stood at a national average of 51.9%, with just 28.7% in Tel Aviv-Jaffa; 39.4% in Jerusalem, where Arab-Palestinians residents of occupied East Jerusalem boycott the vote; and 32.7% in Haifa. This time around, for the three largest cities, participation came in at 57% nationally: 44.7% in Tel Aviv-Jaffa, 35% in Jerusalem, and 47% in Haifa. 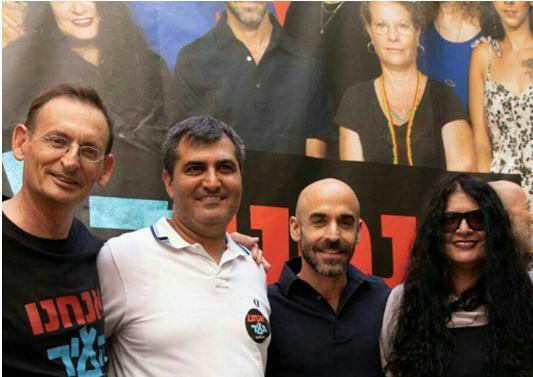 For the Tel Aviv-Jaffa municipal council, Hadash took part in the “Anahnu Ha’Ir” (“We are the city”) a Jewish-Arab leftist list headed by the mayoral contender Assaf Harel; Attorney Amir Badran from the Arab quarters in Jaffa; feminist and anti-racist activist Shula Keshet, head of the municipal committee for the poverty-stricken south Tel Aviv neighborhoods; former Peace Now movement CEO, attorney Moria Shlomot,; former Cinematheque director Alon Garbouz; well-known labor union advocate Orna Lin and a refugee from Congo, Maria Josa. Harel, Badran, Keshet and Shlomot were elected to the Local Council. Labor Party Mayor Ron Huldai, 74, won the mayoral election in Tel-Aviv on Tuesday. He has won the past four mayoral campaigns by a large margin, receiving between 51% and 62% of the votes. The biggest challenge to Huldai’s mayoral position came in 2008, when Communist activist MK Dov Khenin (Hadash – Joint List) ran on a platform focusing on social and environmental issues, and managed to capture 37% of the votes. The Joint List, which has 13 seats in the 120-seat Knesset, did not collectively nominate a candidate for any of the local elections. Hadash independently nominated candidates and its activists campaigned throughout the country. Hadash candidates participated in 41 local lists, either independently or in association with other political forces, from Rahat in the south to Ma’alot-Tarshiha in the north, among them are lists for the cities of Tel Aviv-Jaffa, Haifa, Nazareth, Umm el-Fahm, Ramla, Lod, Akko (Acre), Sakhnin, Rahat, Nazareth Illit, Tira, and Karmiel. In Haifa, the Hadash Arab-Jewish list headed by journalist Raja Za’atry, head of media for the Arab High Follow-up Committee; Shaira Shalabi, a social worker and feminist activist; and Dr. Ornat Turin, a lecturer and researcher and activist in the Teachers’ Union won two seats in the Local Council. In Karmiel, in the Galilee, Hadash and Meretz formed a Jewish-Arab joint list: “Rainbow for Social Justice” (Keshet LeTzedek Hevrati) and garnered 500 votes. The Nazareth campaign was the most violent of the Arab community in Israel. Three months prior to Election Day, the mayor Ali Salem was thought to be unbeatable. Then came Walid Alfifi, presenting a serious challenge. Hadash, which has controlled Nazareth city hall for more than three decades, did not run a mayoral candidate this time around, instead throwing its support to Alfifi. The heated mayoral contest descended into heated rhetoric on social media and supporter violence. Salem won the election. He is known for a blunt and aggressive style, is considered a friend of the Israeli Zionist establishment and was received by Prime Minister Benjamin Netanyahu and other members of the cabinet after Salem expressed harsh criticism of Hadash Knesset members – notably Joint List Chairman Ayman Odeh – and the Higher Arab Monitoring Committee in Israel headed by former Hadash MK Muhammad Barakeh. Hadash candidate, Dr. Safwat Abu-Ria, won the mayoral elections in the Arab city of Shakhnin. In addition, Hadash candidates won the elections in the Galilean villages of Kufr Yassif, Dir-Hanna and Eilabun. In Central Israel, Darwish Rabbi won in Jaljulia and Ma’amoun Abed Al-Hai was victorious in Tira. Hadash council members were elected in several cities and local councils, among them Lod, Ramle, Nazareth Illith, Umm el-Fahm, Maghar, Shefamr, Majd al-Krum, Nazareth and Rahat.